Consensus is building around the many benefits of compact cities. Overall, compact cities use fewer resources, produce fewer carbon emissions, and provide better quality of life for their inhabitants than their sprawled counterparts. In rapidly urbanizing countries in the global south, however, many medium-sized cities are expected to double their populations in the coming decades. This increase will strain efforts to achieve compact urban development. While some of these cities have densities three times higher than those of cities in industrialized economies, some degree of urban land expansion is inevitable. If current trends continue, the amount of developed land in these cities could triple between 2000 and 2030. With these issues in mind, New York University (NYU) created the Urban Expansion Initiative in 2013. The basic concept of the Initiative’s making room approach is simple. It entails working directly with city leaders to realistically assess where urban populations are expected to expand so that strategic plots of land can be identified as sites for public space, infrastructure, or transport, and then acquired before they are lost to development. By planning for future growth in this way, cities can ensure that development happens in a way that is compact, sustainable, and equitable. Planning for growth is a challenging task. The planning process around the making room approach must be long-term, but this timeline often conflicts with city leaders’ short-term interests. This approach requires significant investment from local and sometimes national governments, and can involve difficult negotiations with landowners. Where possible, the Initiative attempts to influence cities to avoid direct payment when purchasing land and instead rely on land value capture financing to compensate the owners. Such methods can be challenging for cities because they require financial expertise and political will to ensure that compensation makes its way to the existing land owners. The consequences of failing to plan for expansion are clear. In Brazil, beginning in the 1940s, development began to expand beyond the boundaries over which the municipal government had jurisdiction. Control over development in these areas was then functionally ceded to residents and real estate speculators, resulting in often-chaotic, uneven development that would leave disconnected, empty spaces. Additionally, many developers didn’t provide basic services and some committed outright fraud. 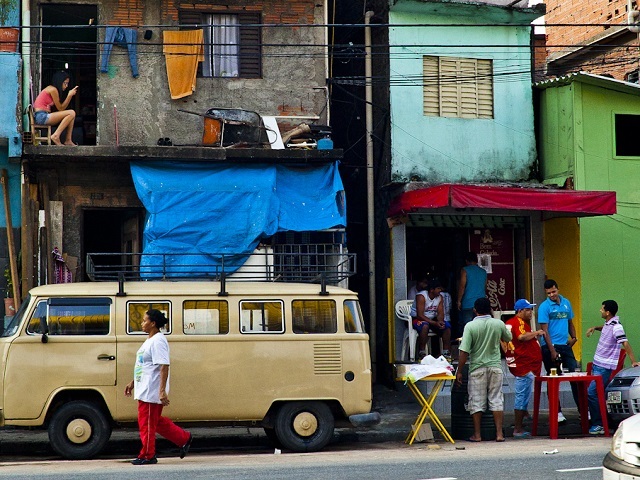 Due in part to these trends, a comparatively large proportion of São Paulo’s slum (favela) population now resides in the city’s periphery, where they face long commutes and lack adequate infrastructure. Fortunately, the city has shifted toward more compact growth in recent years. But had leaders taken a closer and more realistic look at rapid population growth from the beginning, they could have taken a more calculated approach to development and avoided many of the city’s current growing pains. By contrast, the benefits of the making room approach—if applied effectively—are equally clear. Purchasing and retaining land for arterial roads and public space can cost-effectively avoid many of the potential drawbacks of rapid urbanization. Creating infrastructure or public spaces retroactively and without available development-free land costs three to nine times as much and is more damaging to existing communities than making room tactics. And, while there have been innovative efforts to provide efficient and integrated transport for residents of informal communities, these innovations would not be necessary if neighborhoods had proper access to road infrastructure in the first place. With greater knowledge of and control over growth, city leaders can influence urban expansion to generate compact and transit-oriented development. While these benefits are compelling, cities should put the making room approach in perspective given the importance of each city’s unique context. To properly manage expansion, cities should balance expansion with added density and integrate regional and metropolitan planning in a comprehensive vision for development. This can include analysis to better understand natural and ecological networks, economic geography, growth patterns, transit connectivity between settlements, and other relevant factors. Bangalore, India has already moved toward such an approach by creating a Revised Structure Plan for 2031 for its metropolitan region. The plan attempts to shape urban expansion through a detailed land capability analysis, which examines land to determine its suitability for particular uses. While the likelihood of full implementation remains uncertain, the plan itself represents a vital step toward ordering and steering urban growth in sustainable ways. Furthermore, in order to pursue the making room approach, cities must ensure they have the appropriate mechanisms for procuring land. Otherwise they risk missing out on opportunities for shared prosperity and equitable growth. Beyond the traditional means of land acquisition or even land value capture, city leaders should explore new models of partnership with land owners such as land pooling mechanisms and the town planning schemes seen in Gujarat, India. The Urban Expansion Initiative has grown rapidly in the past year, expanding its efforts from its pilot countries of Colombia and Ethiopia to India, Mexico, Ecuador, Malaysia, and China. However, the scale of the issue is far greater than any single initiative can address. Now more than ever, city leaders must take a serious look at the future of urban land, and make sure that they capitalize on opportunities to ensure efficient and sustainable growth.